Inspired by Rothko & Gelli Arts! The summer is flying by here in Houston, and it has been SUPER HOT! So, what do you do in the sweltering heat? Stay inside and Make Art, of course! You may be wondering why my title says, Inspired by Rothko, and here I am talking about Gelli Plate printing. Don't worry, I'm getting to that! I have a million ideas about how to use my Gelli Plate - from found objects, to stencils, to simple color exploration. Except, I can't do them all at once. So, you see my problem. For the next play session, I mulled over several options--there are ENDLESS options!! My Gelli Plate is an 8x10, rectangular plate :) Perfect size for 9x12, 8.5x11, or even smaller paper. While mulling, I began thinking of Mark Rothko, one of the founders of abstract expressionism. I love Rothko's paintings. In fact, I can honestly say that he is one of the main reasons that I began painting. -- You know, that thought that often gets me into trouble! I thought, if he can do it, I can do it. At the time, I just wanted to make art. I had only just begun to appreicate abstract work. I had no thoughts about the "why" or the meaning behind it all. I remember the experience so well. The painting was a huge blue canvas painting, saturated with color, and intensity. It was overwhelming and beautiful. A painting is not about an experience. That's one of my favorite things about Rothko. He wanted you to be part of the painting. If you live in the Houston area, you can experience this for yourself at the Rothko Chapel. I've been there...it's amazing. All of this thinking about Rothko made me want to paint color field paintings. 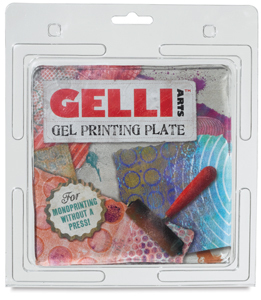 What better way to do that than to try it on my Gelli Plate! Rothko painted in layers of color! Monoprinting is all about layering! I had a great time attempting color fields on my Gelli Plate. Unfortunately, there were technical difficulties, and I had to voice over the video, rather than showing it in real time. Thank you for reading and watching! My Supply List is below, as well as some pics of the results of my colorfield painting play session. Note: any acrylic paints/colors you have will work. I hope you enjoyed this peek into my studio! Don't forget to share and subscribe, both to my blog and my YouTube channel. Thanks!! For more Rothko, check out my Pinterest board! Next week: Color field monoprinting, 2nd try!